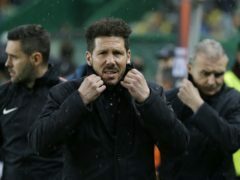 Atletico Madrid boss Diego Simeone felt his side showed “balls” for the way they saw off Serie A leaders Juventus 2-0 in the first leg of their Champions League last-16 tie. Late goals from Jose Gimenez and Diego Godin earned Atletico Madrid a 2-0 victory against Juventus in the first leg of their Champions League last-16 tie. Juventus coach Massimiliano Allegri is determined to end Atletico Madrid’s unbeaten home record in the Champions League and take a massive step towards the quarter-finals. Juventus boss Massimiliano Allegri believes his side are in fine fettle heading into a crucial stage of the season. Alvaro Morata’s torrid spell at Chelsea is effectively over after the striker moved to Atletico Madrid on an 18-month loan deal on Monday.